One goal my husband and I have in restoring our beach cottage, The Coral Cottage, is to keep the old Tybee cottage feeling alive. We want to update it and give it some pzazz but not make it so modern-looking that it loses its cottage appeal. We wanted energy efficient appliances and so when Lowes had a big sale this summer, we bought our appliances. Lowes has held them in storage until I called them recently to schedule delivery. At the risk of dating myself, I remember my mother having a range like this in her kitchen back in the day when it was the latest thing! It gives me warm fuzzies to look at it and think of Mom. I decided that if the range was in good working condition (which it is) then I would see if we could find somebody to paint it a bright color. 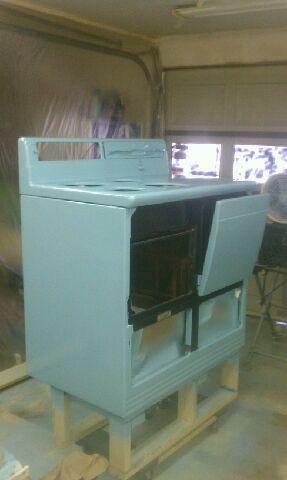 John Horton from Horton Remodeling found just the person for the job and now the range is a bright turquoise! All this beauty lacks now is her chrome which is off being polished up and restored thanks to our friend, Tommy McFarlin, who knew just where to take it. He restores old cars and the chrome has gone to one of his favorite service shops in Atlanta for a facelift. Believe me, Mom would approve! She always did like a little bling! YaY!!! I'm your first follower!! I have stayed at 99 steps on tybee on a girlfriend trip a few yrs ago...and love jane's work. Excited to watch as you move along....it's looking great!!! Coral Cottage is precious!! Yaaaay! So excited to have an official follower! 99 Steps is wonderful, isn't it? Jane really understands these old Tybee cottages and I have loved working with her. I'm so thrilled with how the Coral Cottage is coming along and I'm glad you are going to share the journey with me. I'm your second follower and I just got back from a four-day stay at the "Made in the Shade" cottage on Tybee Island. I live in Northern Ontario, Canada and we drove to Tybee and spent a day in Savannah. 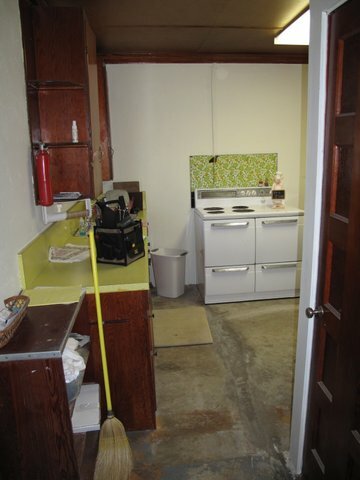 Julie, I'm thrilled that you are coming along on the journey of fixing up our Tybee cottages. You came quite a long way to spend just a day in Savannah--maybe next time you come you can stay at The Coral Cottage! Thanks Vicky, we took a horse drawn carriage tour of Savannah to allow us to see some of the sites, the guide was great! That sounds like fun. I've always wanted to take a horse-drawn carriage ride! The stove..***sigh** so cute. Your mom is just precious! Looks like she was alot of fun to be around.